Polish senators approve bill making it illegal to suggest Poland was responsible for Nazi atrocities. President must now sign it into law. Polish senators overnight Wednesday approved a bill which would make it illegal to suggest Poland bore any responsibility for crimes against humanity committed by Nazi Germany on its soil during World War II. The upper house of parliament voted 57-23, with two abstentions, to approve the bill, according to AFP. 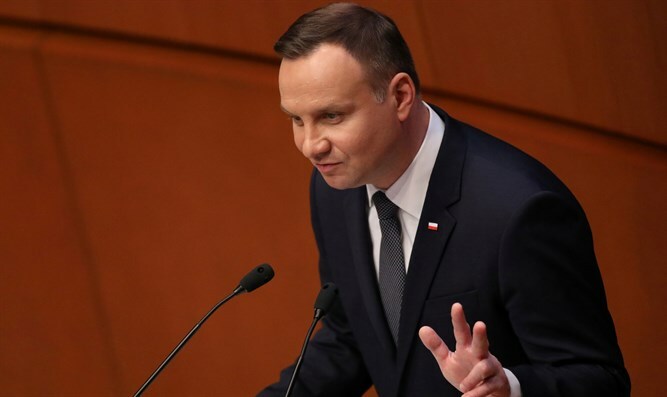 The legislation will now be sent to Polish President Andrzej Duda to be signed into law. Duda said earlier this week he supports the bill and insisted there was no institutionalized participation by Poland or its people in the Holocaust, though he did acknowledge that individual Poles took "wicked" actions against Jewish neighbors. The legislation was widely criticized in Israel by lawmakers from across the political spectrum. Prime Minister Binyamin Netanyahu was one of the critics, saying on the weekend, "The law is baseless; I strongly oppose it. One cannot change history and the Holocaust cannot be denied." The approval in the Senate came hours after U.S. State Department spokeswoman Heather Nauert urged Poland to re-evaluate the bill, saying the United States is concerned about the repercussions on Poland’s relations with the United States and Israel if the draft becomes law. “We encourage Poland to re-evaluate the legislation in light of its potential impact on the principle of free speech and on our ability to be effective partners,” she said.